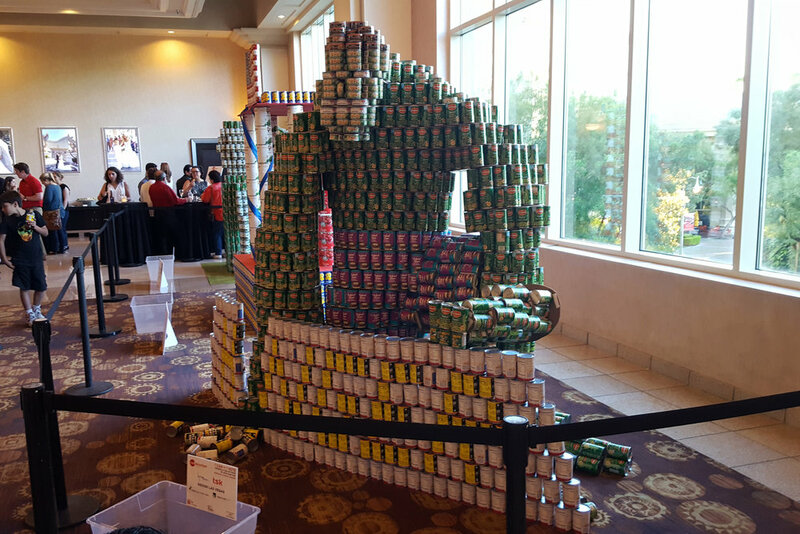 The team of Design Las Vegas won four of five categories at Canstruction 2018 in Mandalay Bay. This year's theme was 'Champions Against Hunger.' The Design Las Vegas team's entry was 'Hulk Smash Hunger,' featuring the Incredible Hulk smashing the word hunger. The seven-foot tall design included 2,000 cans and several layers of plywood, wood spacers, nuts, bolts, velcro and rods to keep the structure intact. Donations of cans of food are being accepted from the public and the People’s Choice Award will be determined by the number of cans donated to each design entry’s corresponding bin. Each can of food is considered a vote for that particular entry. The exhibition will run from April 24 to May 5 (available 24 hours). The Design Las Vegas entry won Best Use of Labels, Best Meal, Best Original Design and Structural Ingenuity. The team consisted of Ewa Koza and Edgar Antonio Nunez (TSK); Eric Gross, Whitney Nelson, Christian Boholano, Rudy Hernandez and Eileen Elento (KME Architects); Sandra Contreras, Sheldon Anguay and Kyle Stringmann (Carpenter Sellers Del Gatto); and Sara Rind (Simpson Coulter). The team went up against five other architecture and engineering teams. As the AIA Las Vegas website describes Canstruction, "this challenging design competition provides a way for architects, associates, engineers and others to collaborate on the design and construction of a structure made entirely out of full cans of food and at the same time, provide a great benefit to Three Square."